There are six prefects assigned to a House so the chances of becoming a Hogwarts authority figure is pretty slim. Grades need to be perfect, your relationship with all the professors need to be perfect, basically, you need to be perfect, but being a prefect isn't all fun and games. It's a lot of responsibility, stress and it also means you can't do anything wrong—ever. (How boring!) Instead of dedicating your life to being perfect (which is impossible, by the way) just pretend you're a perfect prefect instead (try saying 'perfect prefect' 5x fast!). 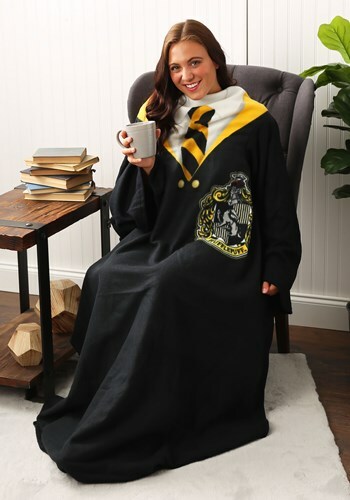 By wearing the Hufflepuff comfy throw. You'll have the signature look of the authority figure without being a perfectionist. The officially licensed Harry Potter-inspired throw is created from fleece fabric so it's super-soft and feels great when wrapped around you. It measures 71-inches long by 48-inches wide and features a large Hufflepuff House emblem, a striped tie, and a yellow collar. Want to solidify yourself as a Hufflepuff student? (At least in your imagination) Then stock up on Hufflepuff stuff. We have apparel to make you feel like a Hogwarts student and Hufflepuff home decor too so recreating the legendary dormitory is possible!